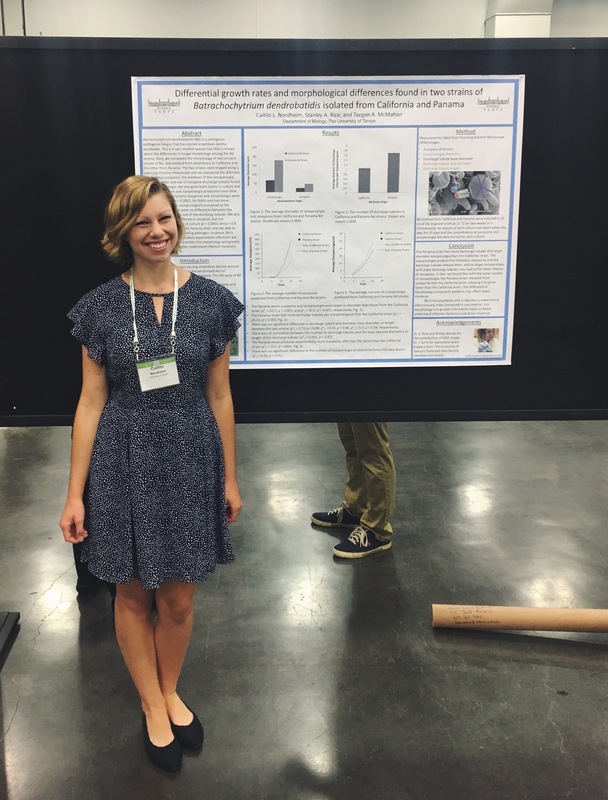 This summer I had the incredible opportunity to present my research on the morphology of Batrachochytrium dendrobatidis, a highly contagious pathogenic fungus that is causing mass amphibian decline worldwide, at the Ecological Society of America’s Annual Meeting in Portland, OR. I was able to attend thanks to funding from UT’s Honors Program. Through various poster presentations, oral sessions, and symposia, I was exposed to a broad variety of current ecological research. In between the organized talks, I got to meet scientists from all over the country and was able to inquire about their research methods, backgrounds, and ask for advice for the future. While I have presented my research at a regional undergraduate conference in the past, it was a very different experience at the national level. While presenting my poster, I got to network and brainstorm with established scientists about future work and potential collaboration. Overall, the Ecological Society of America’s Annual Meeting helped me to better prepare for my future science career. Previous Honors Symposia – Dan Walden – Pirates!